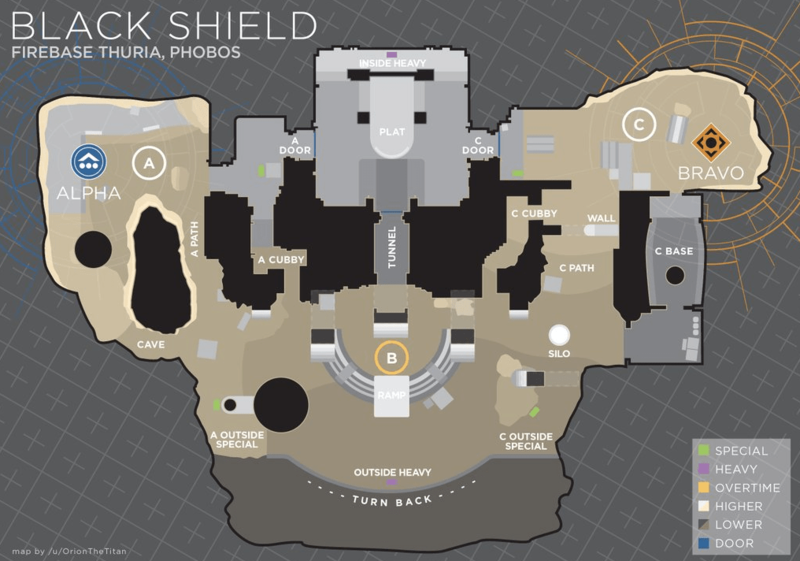 A mostly-symmetrical map with motion-sensor doors and a gladiator style circle to battle for the capture point – welcome to Black Shield. Inside or Out? That is always the question at the beginning of each round. Many teams love the fast-paced action of charging inside in an attempt to claim the center platform our out-snipe opponents by the doors. This strategy can work effectively as long as speed is utilized. The first team to the center will likely win, and if you hesitate even for a second when spawning, you might want to head outside. Moving outside first can be a stronger tactical advantage for the patient team. There are far more angles to snipe from and paths to move up if shotgunning. The capture point also falls on the B flag in the center of the map – an area that cannot be controlled from inside the base. Holding down B will force a team to come outside if their plan was to stay indoors and set a trap. Heavy ammo spawns equidistant from each team, one box inside and one out near the edge of the map. Prepare for teams to split up often, but don’t be surprised if all three rush to one box. If you’re attacking inside, watch out for grenades to fill the tiny hallway. If outside, be sure to check for waiting snipers before standing out in the open to pick up the purple. If you ask me, I’ve got one tip for Black Shield, which happens to be my favorite map: stay off that platform over B. You know the one – high up, capable of seeing the whole map, and right smack dab in the middle. It’s perhaps the most exposed position on any Crucible map and just begs a sniper to take you out from anywhere on the map. Even if you want to control the outside, do so from the small ramp or near the edges by special ammo boxes. Get down from there, I’m telling you! Sunsinger: Still a dangerous threat with the “super-burn” tactic (firebolts paired with the Viking Funeral perk), Sunsingers will do well to keep enemies at bay with their grenades. The Fireborn perk can occasionally save a round, but remember that the super does not last as long after the April balance patch. Use it wisely and don’t get sniped. Stormcaller: The Stormcaller grenade game won’t net a lot of kills but can certainly help with map control. An aggressive warrior will do well with Stormcaller if utilizing the incredible range of the melee paired with a shotgun. Stormcallers are now capable of building up quite a bit of recovery which will get you back in the game faster when weak. Voidwalker: The energy drain mechanic has improved tremendously in the April Update, and Axion Bolts will always do well to keep enemies on their heels. But with the Nova Bomb, a Voidwalker possesses a shut-down super with range that can be instrumental in saving a round, especially when Bladedancers and Sunbreakers start roaming the map. Sunbreaker: No longer the all-powerful gods they were, Sunbreakers still possess a threat. Cauterize gives them an ability to heal incredibly frequently, and the “Sunscharge” super perk does an impeccable job of cleaning a room when used correctly. Focus on stopping revives with the flying shoulder and be aggressive with these monsters. Striker: Perhaps one of the best subclasses for any game mode right now, Strikers possess the full package: speed, tools, and defense. Lightning grenades are incredibly powerful both in offensive and defensive situations, and the Fist of Havoc can save you in a pinch if a Bladedancer gets up close. Defender: Overall not the best choice for Trials, but Defenders have a few highly underrated moves that can certainly throw enemies off. Suppressor grenades are one of the best ways to infuriate an opponent, especially if you pull them out of their super. If a round goes to the tie breaker, placing a bubble right over the capture zone is a great way to secure the win. Bladedancer: Some may argue the Bladedancer is a shell of the class it used to be, but many of the best players in the world still utilize the Arc Hunter to impressive effect in Trials of Osiris. The Quickdraw perk is a sniper’s dream, and skip grenades have been known to chase players across entire maps. Don’t underestimate the blade. Gunslinger: Forever the trusty subclass, Gunslingers have a great super that can be used effectively in both offensive and defensive scenarios. They do best on maps and areas with walls and enclosures, because Tripmine grenades work wonders to surprise aggressive enemies and deny revives. Nightstalker: Currently a popular choice for Hunters, Nightstalkers are the kings of 1v1 engagements thanks to the Shadestep. The super can be difficult to use effectively but highly appreciated when a Bladedancer or Sunbreaker comes charging in. Be sure to utilize the “wombo combo”, a phrase passionately used to describe throwing a smoke grenade and void grenade in quick succession to trap and kill an enemy. It’s a deadly one-two punch.